Doctor Ronghua Jiang was a medical doctor in China. She graduated from Nantong Medical University in 1983. Then, she practiced western medicine in Jiangsu Province, China for over nine years. 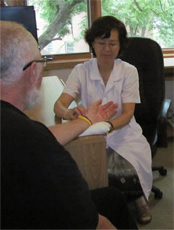 She studied and practiced Acupuncture and Chinese medicine as required in medical school. During long term practice, she combined western medicine with Chinese medicine and Acupuncture, successfully helping many people with a variety of physical and psychological problems. After coming to the US, she worked in Virginia Masion Medical Center, Seattle, WA. as a staff scientist mainly doing research on human immunology and auto-immune diseases. Currently, in her Prosperity Acupuncture clinic, Dr. Jiang incorporates Chinese Medicine and acupuncture with western medicine theory to offer many treatment options to a wide variety of patients.